DENMARK – Gerard Rosek figures the moment you start talking about retirement, you’re already done. Don’t worry. He’s not talking about retirement. In fact, he can barely utter the word without becoming emotional. To listen to the 1967 Green Bay Premontre graduate’s palpable enthusiasm for his kids and his vocation, he might still be in the first season of a dream job. And why not? He loves football, loves teaching, loves the kids, loves teaching kids football, loves having fun, loves teaching the kids how to have fun and loves guiding them through the tumultuous transition years from freshman to sophomore, from JV2 to varsity. As a result, Rosek has never had much desire to become a varsity head coach. He’s found his niche, which just also happens to be his passion. And when it was pointed out to him at one of the summer football camps he attended that the freshman coach may be among the most important in the entire high school program, it made him feel kind of important. He likes being able to remind the varsity coaches to be patient, that these are barely teenagers. He gets to see that first-hand, after all. Rosek, who calls himself a farm boy, picked up football when he went out for the JV team at Premontre in Green Bay in 1967 as part of the desegregation busing policy. There were no strength and conditioning programs in those days and that worked to Rosek’s advantage. He was already strong and working on a farm certainly didn’t hurt. 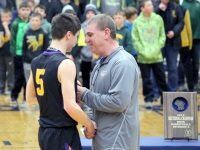 He developed a passion to coach but didn’t go on to college and that desire sat dormant for three decades. Then, in early summer 1999, he and his wife, Susan, discovered an ad for an assistant football coaching job in The Denmark Press. “I was pretty busy then and I thought, ‘well, maybe next year,’” Rosek recalls. 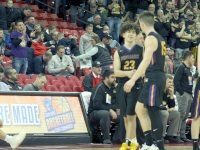 “Then I see the ad again a couple weeks later and I went to see the principle at the school and told him I was thinking about it. Somehow the head football coach gave the principle the playbook and he called me and told me to come pick it up. That the ad ran almost 30 years to the day after Rosek graduated high school strikes him still today as fate. For the first 12 seasons, Rosek co-coached the freshman team. His emphasis was on fun and also on making “freshman football what it should be, which is teaching core values as a human being,” he says. Things have changed a lot over two decades. 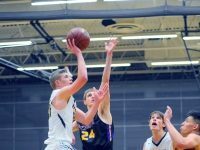 For one thing the Denmark freshman – and more recently, the JV 1 and JV 2 – teams have switched conferences twice, going from the Packerland Conference to the more challenging Bay Conference in 2007 and then again, in 2015, to the North Eastern Conference. The designations have changed as well. In 2015, there was no longer a freshman team but rather a JV 1 and JV 2 team. 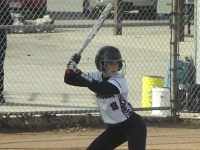 The JV 1 consisted of mostly sophomores and juniors, some of whom skipped up to the varsity during the season. The JV 2 team was mostly comprised of freshman and sophomores. The other thing that is different is participation. Thanks to the concussion scare of recent years, fewer kids are coming out. And now that Denmark has started a boys’ soccer program, some of the faster, more athletic types are gravitating toward that and away from football. 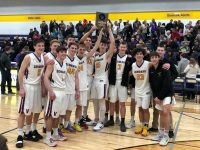 Participation dropped from around 70 three or four years ago to 50 the past several seasons, forcing the Vikings to eliminate the JV 1 squad entirely. Lower participation is one of the reasons Rosek focuses on the fun aspects of the sport. Though Rosek was a lineman in high school, he was pretty fast, and he used to challenge his freshman kids to races. Rosek remembers a practice quite a few years back when the kids were horsing around and ripped the tag off one of the other players’ jerseys and everyone was chasing the kid around the field. He told them to give him the tag, that he had a plan. The plan was to use the tag as the kicking block when the team scored its final touchdown of the season. “We scored that last touchdown up at Southern Door and the kid runs out there with it and my other coach is looking at me like, ‘what’s going on?’” Rosek recalls. “Why, it was the most beautiful extra point you’ve ever seen. Fun and success have hardly been mutually exclusive. Rosek’s freshman teams posted a 45-11 record with three titles and a co-title as members of the Packerland Conference from 1999-06. As the smallest school in the Bay Conference from 2007-14, the Vikings held their own against teams with twice the roster size, going 25-30-2. They are 19-8-2 in three-plus seasons in the North Eastern Conference. Rosek says he is excited by what first-year head varsity coach Tom Neuman has done in the seven months since he took over the program. Rosek was on the selection committee so he got to know Neuman, a Wisconsin native who spent the past 15 years as an assistant at a high school in the Dallas area. Rosek has been through four coaches during his tenure and he’s high on the new guy. 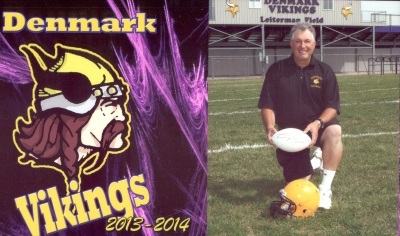 What he particularly likes is the way Neuman has poured himself into the area youth programs, something Rosek believes is essential in terms of establishing continuity in Denmark football. Indeed, the Vikings are 3-3 and have a chance to go over the .500 mark for the first time since 2014 when they travel to Marinette on Friday. The praise goes both ways. “He’s been an unbelievable resource,” Neuman says. “He knows the Denmark community so well and has really helped me build a foundation. Coaching-wise, he’s done a fantastic job and a good job of getting my message across about building good football players and men of character. So Rosek is inspired to continue for who knows how long. He certainly has his wife’s support. Susan was there from the beginning, camcording games and recording stats way back in 1999 when that was rare. She still submits game articles to The Denmark News each week. Nor can you be without a love and understanding of the kids you coach.